Not freestanding, attaches under worksurface. 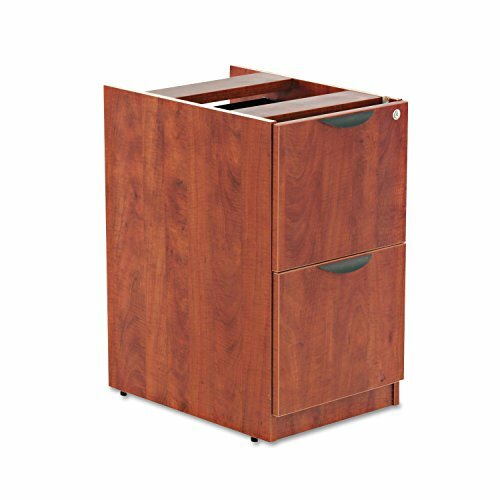 Sturdy four-sided drawer construction with separate front panel. Full-extension ball bearing slides on file drawer for easy access. Drawers lock for securing contents. Durable 3 mm edge banding protect against bumps and dings. Two fold-away safety keys (included) for a slimmer profile. Color: Medium Cherry; Overall Width: 15 5/8"; Overall Depth: 20 1/2"; Overall Height: 28 1/2". Drawers lock for securing contents. Full-extension ball bearing slides on file drawers for easy access. Durable 3 mm edge banding protect against bumps and dings.